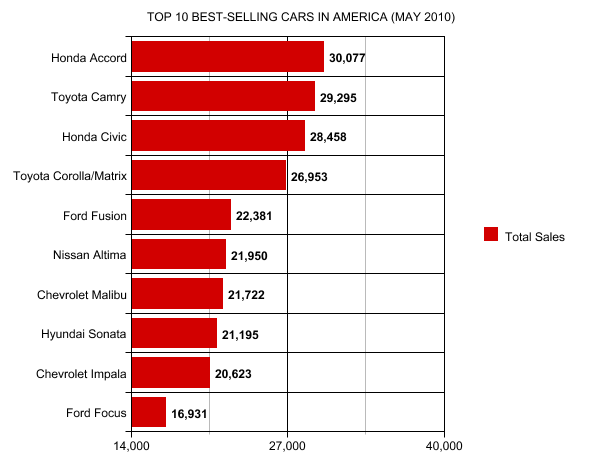 So the Honda Accord was America’s best-selling car in May 2010. Surely Honda is pleased. Those who love to share in popular movements and happen to own an Accord already are certainly proud. But more interesting to the outside observer is the beating Honda’s Accord lays on its competitors. The Toyota Camry, frequently seen in the #1 spot, isn’t far back from the Accord. 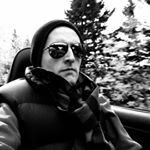 However, behind the Accord and Camry…. way, way behind, are vehicles believed to be rather successful. The Ford Fusion, Nissan Altima, Chevrolet Malibu, and Hyundai Sonata are hot sellers, but the closest of the lot trailed the Honda Accord by 7696 sales in May. That’s a chunk. And we’ve only discussed the relatively successful competitors of the Honda Accord. Accords sold about nine times more frequently than did the Mazda 6 in May; approximately 26 times more than the Volkswagen Passat. Combined sales of the Chrysler Sebring and Dodge Avenger are less than one third the Honda Accord’s May 2010 total. The Kia Optima, Subaru Legacy, Suzuki Kizashi, and Mitsubishi Galant pose hardly a threat to any single potential Accord sale. America’s Top 10 best-selling cars also include a few compacts, a handful of cars which combine to make up the vast majority of their segment’s sales despite numerous competitors.